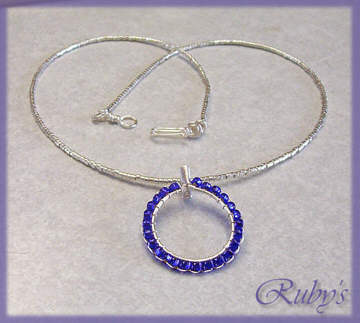 Ruby wrote a very nice tutorials and shared it to the public on how to make wired hoops for pendants and earrings, I thought, that is very nice of her. I get to know Ruby from a forum - she always been helpful and never refuse to share what she knows. She does knowledge transfer, she does knowledge sharing. We all love her very much. Just a little highlight about Ruby. Ruby wrote these tutorials for free for a reason: if she start charging for her tutorial, she lost her ability to create - that's why she is not charging anyone. You are allowed to learn and share knowledge from her tutorials, after all that's what she wanted - to transfer her knowledges to whoever that wants to learn. However, IMHO, you should take a look at this page before you leave her wonderful tutorials. Yes, very nice tutorials she is sharing!